I am trying to learn to machine quilt. Right now I just want to conquer the walking foot. I am not ready for free motion quilting yet. I have quilted the inside blocks but need ideas for the borders. I would love to hear some suggestions. You can do gentle curves with walking foot. I've done rope type designs. Any type of cross hatching will work out well. Sometimes I just crosshatch or do successively bigger boxes around. I like doing curves too with the walking foot. you move the quilt to the left and then right as you go along. slowly on the corner turns. grids would be good too. you could measure where you want to go to the outside of your borders, put a pin or mark there and start quilting large V's and then go back and do the V's the opposite way. let us see when you are done, what ever you decide. I do diagonal lines or cross hatching in borders like this. I use wide painters tape, the blue kind. Lay a strip on a diagonal of the end of one of your border, across the middle of the square. Then line your walking foot along the tape. Do not try to sew along the edge of the tape as you will sew into the tape and it is very hard to get pieces of tape out of your stitches. Then move the tape to the other side of your sewing and quilt along that side. Just keep moving and sewing until you go all the way around. If you want crosshatching, then put tape on across going the opposite way. 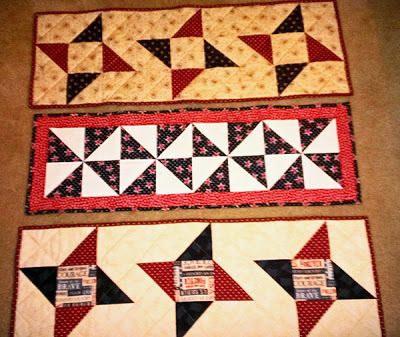 My suggestion would be Crosshatching or shrink the outline of the pieced blocks and do it in the border. Beautiful quilt, love the RWB. I did when at this stage straight lines one shadowing near inside border then found the centre and did a line and one each side width of walking foot away finally when binding on shadow it. Ps my first one I put binding on because I didn't know how to measure the distances. I just finished a small wallhanging and just did straight line stitching the width of the foot I was using. Ended with three lines of stitching, but it looks good. Sometimes simpler is better. I'm not into the fancy stitching yet for the quilting part. I made 3 table runners this weekend. 2 didn't have borders, but one did and I just did straight line stitching the width of the foot - if I remember right it had 4 lines of stitching. It's the middle one in this photo. BTW - I really like your table runner!! I love 'piano keys'-- horizontal lines about an inch apart. However, if you are using a walking foot they require a lot of turning! Either that or a lot of thread cutting and starting over. 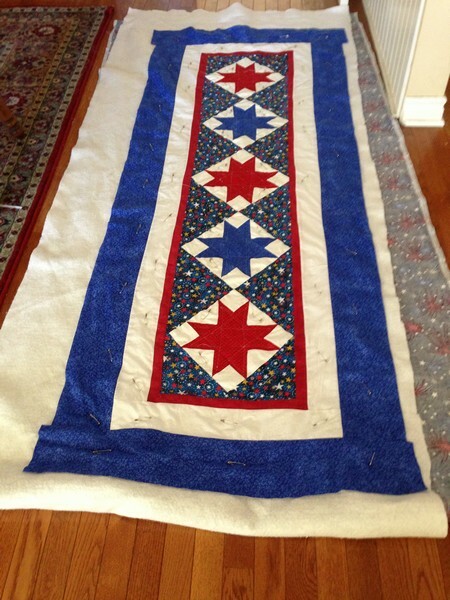 First, let me say it's a beautiful red/white/blue table runner. I would have done SID around the stars also. As far as the borders, I've used the rope design as the gentle curves work great with the walking foot. I've often used the quilting papers that you pin down, then sew along the design lines and tear the paper off. You get a great design and it's easy. Just a thought. All kinds of patterns and stuff you can do with your walking foot are listed on the left. I would do x's in the borders. but that is me. it is really simple and you can do it all in one swipe each way. hope you understand what i am trying to say. love the website. have a quilt to quilt and I love the simple ideas here. I am not the original poster but was looking for the same thing. Thanks -- this helped a great deal! I'm afraid I'm guilty of buying the border stencils at the Hobby Lobby for mine. I love your red white and blue! That will be a lovely addition to any table!